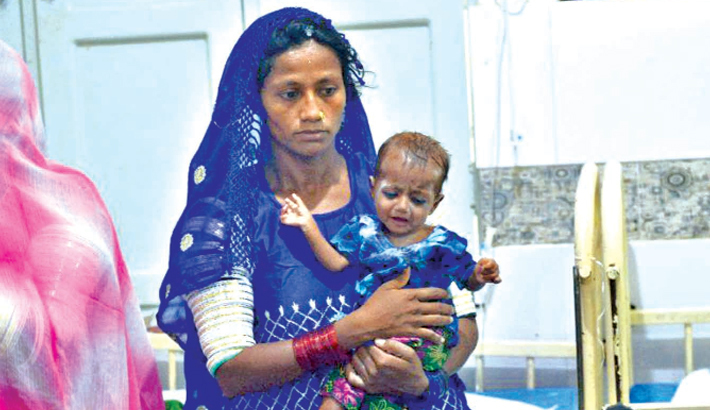 KARACHI: A frantic mother cradling her seven-month-old baby rushes towards the special paediatric ward in a desolate Pakistan town, his eyes are blank and he is smaller than most newborns, reports AFP. The infant weighs just 2.5 kilograms—the average for a healthy child of that age is almost three times that. His case is not unique for the doctors at the Mithi Civil Hospital in hunger-stricken Sindh province where millions survive on less than $1 a day. “Her weight is dropping, even though we consulted many doctors,” the 25-year-old says. The International Food Policy Research Institute (IFPRI), a poverty and hunger watchdog, estimates around one in five of Pakistan’s more than 200 million people are malnourished. And yet, the nation is not short of food—in fact, according to the US Department of Agriculture, it is projected to export 500,000 tons of wheat from May 2018 until April 2019, and 7.4 million tons of rice in the same period. The issues, experts say, are socio-economic—that is, just because food is available, does not mean people can access it. “There are four key pillars of food security in Pakistan: The first is availability, then accessibility, utilisation and stability,” says Dr Ambreen Fatima, senior research economist at the Applied Economic Research Centre of the Karachi University. “Pakistan is quite well off in wheat production,” comments Dr Kaiser Bengali, a veteran economist, who has done field research on poverty and hunger in the country, but adds that much of it is sold for export.